US: Start 1 mallets length (36") directly in front of the wicket #1, along a line defined by the length of a mallet's head (9") parallel to the wicket. US: Balls play in the color order Blue, Red, Black and Yellow. US: Balls may only be roqueted once between each wicket and not before they have run the first wicket . Once a ball has been roqueted you become dead on it (it cannot be roqueted again) until the next wicket has been run, whereupon you become alive on all the balls. US: If a ball plays out of turn the balls are replaced, no points are scored and that side loses its turn. US: You cannot roquet balls before running wicket #1 (entered the game) nor roquet balls which have not been through wicket #1. US: Your turn ends if a ball leaves the court after the roquet. You however remain live on that ball. It does not matter if the striker's ball leaves the court. US: A ball is off the court when more than 1/2 of it crosses the boundary line. US: Balls off the lawn are replaced 9" on to the court. US: Your turn finishes on all occasions that a ball leaves the court unless it is the striker's ball after a roquet. US: You may not hit a ball on which you are dead which lies in the jaws of a wicket when attempting to run that wicket. US: Bisques are an extension of the striker's turn. There are two types of bisques. A replay bisque or a continuation bisque. The continuation bisque is an additional shot taken from where the striker's ball stopped following an earned continuation shot - post hoop or croquet shot. A ½ bisque may be used to position a ball, but no points may be scored. US: You may not block a ball's wicket for more than one turn. US: Once a ball has made a roquet it may not influence the positions of other balls. If balls are displaced by a ball in hand they are replaced in their original positions. 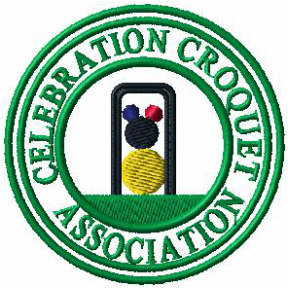 US: You may not hit a ball on which you are dead unless it happens after a roquet or on the croqueted ball during a croquet stroke. US: You may not hit a ball on which you are dead in the croquet stroke. US: When any ball goes through 1-back the opposing team may at the start of their next turn clear the deadness on one of their balls. US: If the striker peels the opponent's ball through 1-back, the striker can clear the deadness on partner ball. US: Rover is run towards the peg. US: A rover ball may clear 2- or 3-ball deadness by running any wicket in any direction in one stroke, whereupon it receives a continuation stroke and may peg out other rover balls. A rover ball may roquet each ball, on which it alive, only once per turn. A rover ball must be dead on at least two balls before it gains relief from deadness by running a wicket in either direction. A rover ball remains "last dead" on the last ball it roqueted prior to clearing deadness. When a rover ball roquets another ball, the "last deadness" is removed. A rover ball may be cleared of deadness with a 1-back clearing, but "last deadness" may not be cleared. US: A rover may only roquet the other balls once per turn. A rover having cleared its 2- or 3-ball deadness cannot hit the ball it last roqueted until it hits another ball. US: Once a ball is pegged out the play continues in proper color rotation, with two shots to one side then the opponent. If another rover ball is pegged out on a croquet shot, that ball is removed and the remaining continuation shot is taken 9" from the peg. US: If a rover ball rushes another rover ball into the peg, the croqueted ball is taken out of the game. The striker's ball then plays its two stokes, the first 9" in any direction from the peg. A ball may not become rover and stake out another rover on the same stroke. US: Two 1 minute time outs are permitted per side. US: Once time is called all the remaining balls have one turn. US: If a ball is wired from any balls on which it is alive and the opponent is responsible for the striker's position, the striker may take a lift to contact with any ball on which it is alive. If the striker passes their turn, they are then responsible for their ball's position and a lift may not be taken in the next turn. If a striker's ball is dead on all balls, the striker may not claim a wire. If a ball is wired by an opponent a contact may be taken. US: If a wiring contact is not taken in the first turn when it arises the player becomes responsible for that ball's position. US: In a wiring decision only balls upon which the wired ball is live are considered. If the next ball to play is 3-ball dead it is considered to be open to a ball for the purposes of a wiring decision.